Guest Contributor Dion Kliner (Vancouver, BC) / John Singer Sargent enigmatically said, “A portrait is a painting with a little something wrong about the mouth.” Was he simply making a neutral observation, or was he talking about their relative value as art? Was it that a portrait is a slightly degraded form of art from a painting; or that a portrait is the more accurate picture of reality, and a painting a corrected, hence idealized, abstracted version? In any case, he identified how minute the distinction could be between representation and abstraction. On a continuum between the two, Sargent would be at the representative end. Lyse Lemieux plays in that small space where abstraction, process, and materiality lean into representation. Helped along by suggestive titles like Red with Open Mouth, and Red and Yellow Figure with Orange Fabric, what look at first like large abstract shapes slowly resolve into loose figuration. Lyse Lemieux, Red with Open Mouth, 2013, acrylic and fabric on archival foamcore, 23 x 40 inches. A collection of drawings, most from 2010 and 2011 and mainly framed, show how Lemieux’s work has evolved. The restraints they manifest on size and material are often dramatically cast aside in the newer pieces, which are generally larger in scale, out of their frames, colorful, and partially peeled from the wall so that their back sides are accessible. They are either painted or covered in various fabrics, the colors mixing with the shadows on the wall behind. Partially revealing the rear teasingly accentuates the fact that there is another side or view, and tends to produce the same sort of frustration one experiences in trying to see the back of sculpture in the round when it’s pushed to a wall or placed in a niche. 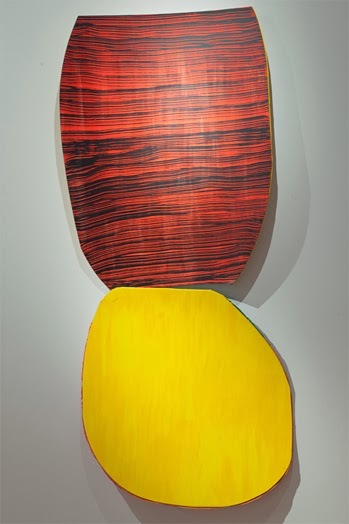 Lyse Lemieux, Red and Yellow Figure with Orange Fabric, 2013, acrylic, ink, and fabric on archival foamcore, 70 x 39 inches. Philip Guston and Louise Bourgeois are two strong influences on Lemieux, and both are in evidence here. Two versions of Guston’s large, roaming head of the artist (HEAD LINES: Looking left at P. Guston and HEAD LINES: Looking right at P. Guston) come right off the wall and stand propped up like signboards in the middle of the room. Both sides are readily accessible, but there is no mistaking which is the dominant view because one, the subordinate, is painted a single color and is partially obstructed by the support. The material support for these drawings is the same thin foam core as the large drawings on the wall, but the props are made of angle-iron. The choice of such a robust material to support something so light makes its discovery comical and Gustonesque, the more so if it’s the weight of metaphor that the drawings are carrying. 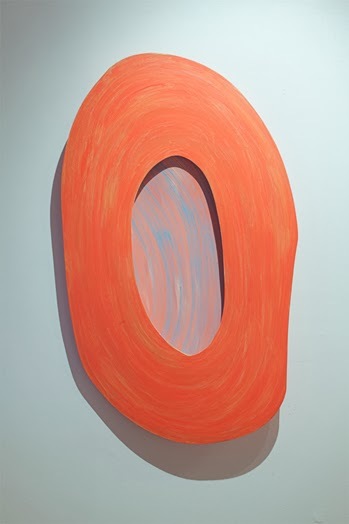 Upside Down Spiral Woman (LB), 2013, acrylic and fabric on archival foamcore, 41 x 81 inches. Lemieux’s nod to Bourgeois is Upside Down Spiral Woman (LB), drawn from Bourgeois’ many Spiral Woman variations. Like most of the other new drawings, aside from the suggestion of eyes on the HEAD LINES, Upside Down Spiral Woman (LB) steers clear of internal figurative indicators, relying primarily on outlines, as did Guston and Bourgeois. The fabric Lemieux uses on the backs of some drawings (Upside Down Spiral Woman (LB) has a pale blue chenille with fuzzy, raised polka dots) function as connective tissue between others (gauze connects the circular front with the rear plane of Red with Open Mouth). As such, they introduce an adventurous physicality and tactility that are slightly at odds with the rather flat, graphic quality of Lemieux’s painting. Nevertheless, the latter remains dominant. Though the show ranges from drawings that are framed and flat, through unframed and peeling from the wall, to freestanding on the floor, Lemieux’s strongest impulse is not towards sculpture but rather remains resolutely towards drawing. The cuts of the knife that define the outlines of the shapes are lines in space, as are drawn lines. But where drawn lines operate against a two-dimensional background of paper, for instance, the cut lines highlight the physical world itself. This might be splitting hairs, but they’re hairs that Lemieux wants to split, as seen in her consistent reference to her work as “drawings” and, more demonstratively, a manner of applying materials which is more graphic than painterly. The color is broadly and briskly applied, and her overlay of heavy black strokes of ink constitute illustrations of giant brush strokes. Lemieux describes Bourgeois’ work as helping us “travel comfortably between what we know, what we think we know and what we think she wants us to know.” Lemieux’s new drawings do the same for the gap between figure and abstraction, and drawing and sculpture, but with a gratifying frisson that Bourgeois would undoubtedly appreciate. 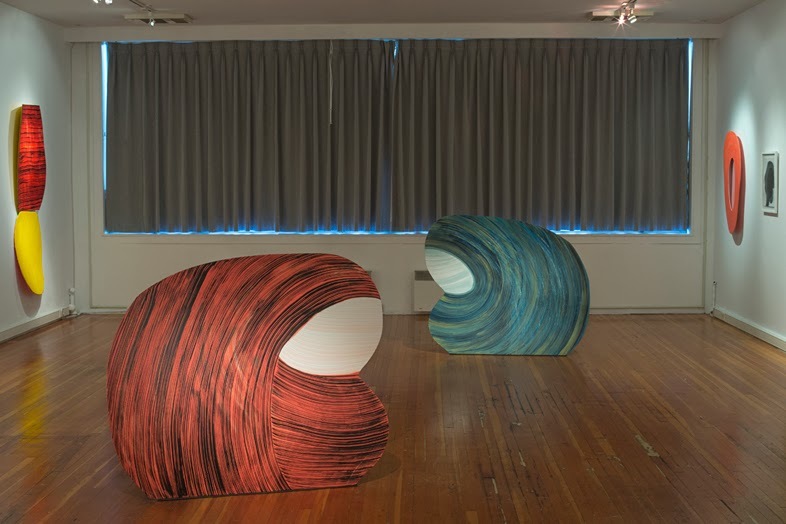 “Lyse Lemieux: Shaped Drawings: something wrong about the mouth,” Republic Gallery, Vancouver, BC. Through February 15, 2014.